The various physical forms in which an element can exist. Colourless , transparent substance with extraordinary brilliance. covalent bonds and forms a regular tetrahedron. Due to this the structure gets very rigid . For removing cataract from eyes. Diamonds can also be made artificially by subjecting pure carbon to very high pressure and temperature . Theses are also called Synthetic diamonds. It is a grayish black opaque substance , lighter than diamond, soft and slippery to touch, conducts electricity, burns on strong burning to give CO2 . The chemical properties of both diamond and graphite are same as both burn in oxygen to give carbon dioxide. However, their physical properties are different due to difference in their structures ( different arrangements of carbon atoms). 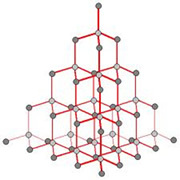 Each graphite crystal consists of layers of carbon atoms. Each carbon atom is joined to three other carbon atoms by strong covalent bonds to form flat hexagonal rings. 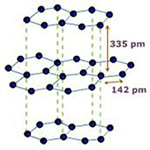 The various layers of carbon atoms are held together by weak Van der Waals forces. Due to sheet like structure it is a soft substance due to which it is used as a dry lubricant fro machine parts. It is a good conductor of electricity - Each carbon atom is joined to only three other carbon atoms by covalent bonds i.e. only 3 atoms are used in bond formation leaving the 4th atom to move freely. Due to this free electron , it conducts electricity. As lubricant for fast moving parts of machinery. For making pencil leads and black paints. It is an allotrope containing 60 carbon atoms joined together to form spherical molecules. It is a spherical molecule with atoms arranged in interlocking hexagonal and pentagonal rings . There are twenty hexagons and twelve pentagons of carbon atoms in one molecule. It is a dark solid at room temp. , burns to give CO2 . , neither hard nor soft.